OREANA, IL--(Marketwire - September 14, 2010) - Tailgating season is upon us. Eating, drinking, and hanging out with family and friends before the big game are staples for a good time. One of the biggest bummers to your tailgate party can be when you forget your favorite dish or tailgating item at home. Here's a quick checklist every tailgater needs before they head out to support their team! Have all your friends bring a side item, and you man the grill. Don't forget to have everyone bring their own adult beverages! Portable grills especially made for tailgating are extremely popular. Do a quick web search to find hundreds of options from big to small. Some are even designed to support your favorite team. Tailgating season can bring all types of temperatures from below zero to hot and muggy. For the latter, you'll need to bring a bucket full of ice to keep your drinks cold. Bags, washer toss, ladder golf, or just a football to toss around are all fun activities to take part in while you are hanging around before the game. Remember to bring plenty of chairs. Folding canvas chairs with built-in cup holders are inexpensive and perfect for tailgating. Yes, you read it correctly. You have plenty of drinks and entertainment for your tailgate, but if you need to use the bathroom, you have to hike to dirty, smelly, and crowded portable bathrooms. Why not have your own bathroom that is clean and easy to transport? The Out and About House is a personal, portable bathroom for your tailgating party. 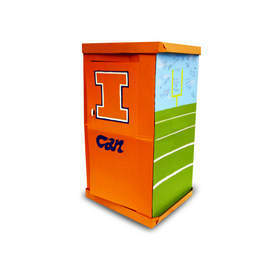 It is easy to set up, and you can even decorate it to support your favorite team. To learn more, visit www.outandabouthouse.com. To download high-resolution images and broadcast-quality video, visit http://www.outandabouthouse.com/press-kit. The Out and About House was invented in 2009 by an avid concert tailgater and is manufactured by Greif, a world leader in industrial packaging products and services. Learn more about the Out and About House or place an order at www.outandabouthouse.com.